what makes it better than the other keyword trackers? If you are using some of the other tracking tools, you may find it showing "Not Ranked" for a keyword that you are actually ranked for. This is because your ranked ASIN for that keyword is different from the ASIN you tracked. This happens a lot when you have multiple variants under 1 product. We solved this perfectly by tracking all your parent and child ASINs together. The highest ranking among all variants will be recorded as the ranking position of your product for that keyword. You can use the "Rank ASIN" filter to easily see which ASIN is ranked for which keywords. You need to know your competitors in order to beat them! Monitor not only your product's current keyword ranking, but also up to 10 competitors right alongside. Spy on your competitors' rankings with ease. Now you'll be able to see where you and your competitors are securing and losing sales with the most comprehensive keyword rank tracker on the market! Launching your product with multiple keywords at the same time? Testing out a few launching methods with different keywords? Let's compare their ranking changes in 1 graph and see which method is performing the best! The “Amazon Choice” badge can significantly improve your product's click through rate and sales. Amazon won't tell you which keywords you gained the badge for, unless you manually search for all keywords one by one on Amazon and verify it yourself. 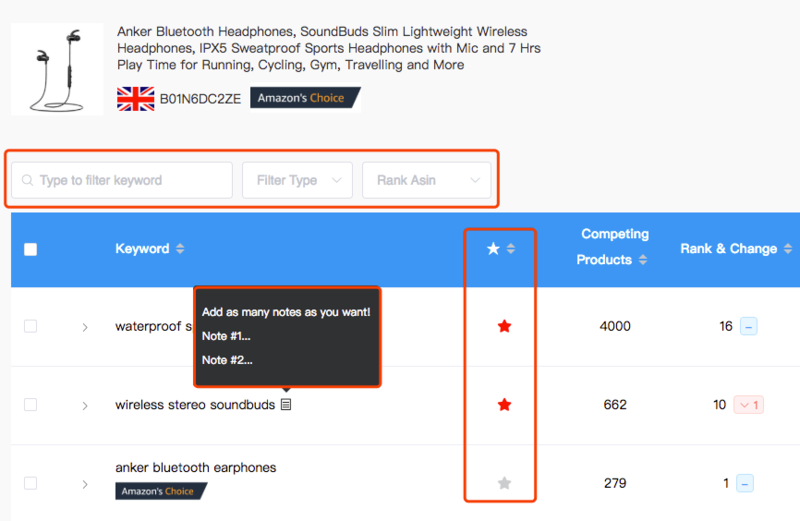 Now you can simply add all your keywords to the tracking list and we will help you find those "Amazon Choice" keywords automatically. Which keyword ranking change has the most impact on sales? A or B? Keyword A: Ranking position improved by 10. Keyword B: Ranking position improved by 1. Keyword A may still stay on page 2 after jumping up by 10 positions, while B may have jumped from page 2 to page 1 with that 1 position change. That's why our tool tracks not only your keyword ranking position but also the ranking page. 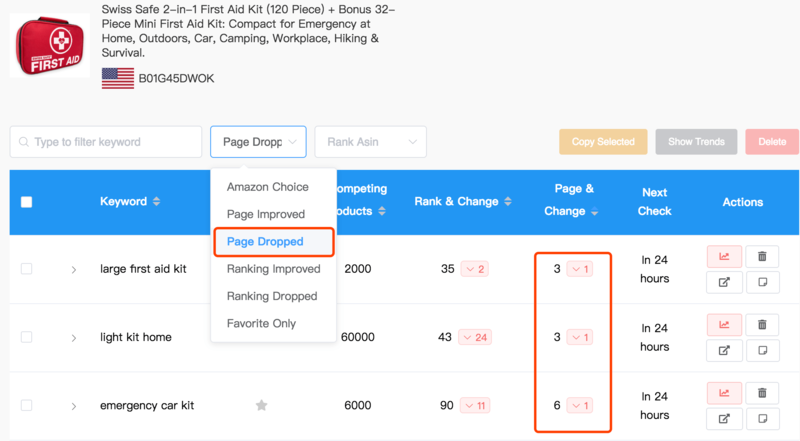 You can use the built-in filter to easily identify keywords which have an improvement or drop on the ranking page and take action quickly. We make it super flexible and user-friendly. You can use the 3 built-in filter boxes to find the keywords you want fast from the hundreds of keywords in your tracking list. Favorite keywords that you want to pay attention to, add notes to keywords & remind yourself of the actions you took, sort keywords by any of the metrics, etc. Play it in your own way!